These shops known as Allans Building is a warehouse designed by Edmund Wright and James Reed in 1886 as an extension to the original Harris Scarfe warehouse in Gawler Place and adjacent to this building. At this time, Sir Henry Ayers and William Kay were joint tenants of the property. The original warehouse was designed in 1863 by George S Kingston for hardware merchant George P Harris. Harris, with Richard Smith, and later Thomas Roger Scarfe, leased the premises from at least 1874. In December 1900, the lease was transferred into the name of Geo. P Harris Scarfe & Co. Ltd and in 1918 to Harris Scarfe who retained the lease until 19 June 1930. It is a four-storey Victorian Commercial Classical building constructed over length of medium size allotment to Gawler Place (front elevation) and Francis Street (rear elevation) alignments. Building has a typical classically detailed façade of painted rendered masonry that uses string courses to divide the elevation horizontally. These and other features highlighted by paint of a different colour. All original arch headed windows (four per floor and of timber joinery) survive intact. Façade is flanked on either end by pilaster on top of pilaster. Roof is concealed behind a projecting top cornice. Recent alterations at ground floor level include detailing, suspended awnings over footpath and advertising hoarding. Rear wall of building forms, with adjoining buildings, a distinctive western wall along Francis Street. Is of unpainted red brick with concrete bands and retains original windows and external stairs. Allans Building is a warehouse designed by Edmund Wright and James Reed in 1886 as an extension to the original Harris Scarfe warehouse in Gawler Place and adjacent to this building. At this time, Sir Henry Ayers and William Kay were joint tenants of the property. The original warehouse was designed in 1863 by George S Kingston for hardware merchant George P Harris. Harris, with Richard Smith, and later Thomas Roger Scarfe, leased the premises from at least 1874. In December 1900, the lease was transferred into the name of Geo. P Harris Scarfe & Co. Ltd and in 1918 to Harris Scarfe who retained the lease until 19 June 1930. This building was effectively combined with Claridge House immediately to the north in 1957. At that time David Murray occupied the basement of Claridge House and the whole of this building. On 19 August 1957 Council approved plans for alterations for the demolition of curtain walls on all floors between this building and Claridge House and the breaking of openings between the two buildings in the basements. In August 1964, Allans Limited acquired the premises only to sell the property in December 1975 to the Adelaide Permanent Building Society. However, despite changing ownerships, Allans have remained in the premises. The ground floor shop fronts were altered in accordance with plans approved by Adelaide City Council on 19 October 1977. Allans were also given approval to alter the shopfront in 1999. 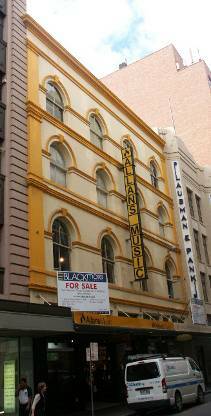 The building is of heritage value because of its long association with two of Adelaide’s major surviving businesses: Harris Scarfe and Allans, and because it retains a great deal of original fabric and architectural detailing. It illustrates several key themes in the city’s history: 3.5.2 Retail and Wholesale Industry; 3.5.4 Small Retail Establishments; 4.3 Development of the Building Industry, Architecture and Construction; and 4.5.2 Victorian commercial (1870s to 1890s); 4.6 Heritage and Building Conservation; 4.7.1 Adaptive re-use.